SMALLER PIECES! TEAR & SHARE! YOUR BITE ! GRAB A BITE! 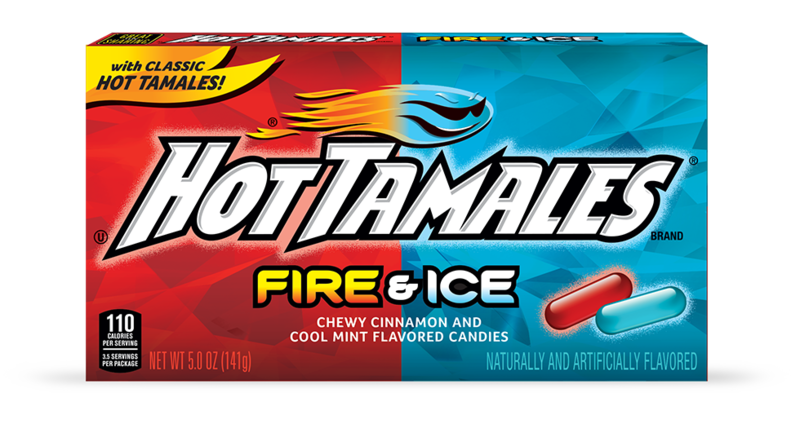 Experience the dual sensation of our new HOT TAMALES ® Fire & Ice, featuring a unique blend of fierce cinnamon heat and cool mint flavored candies. SUGAR, CORN SYRUP, MODIFIED FOOD STARCH, CONTAINS LESS THAN 0.5% OF THE FOLLOWING: NATURAL AND ARTIFICIAL FLAVORS, DEXTRIN, CONFECTIONERS GLAZE, ARTIFICIAL COLOR, MEDIUM CHAIN TRIGLYCERIDES, CARNAUBA WAX, SODIUM CITRATE, PECTIN, CITRIC ACID, MALIC ACID, FUMARIC ACID, RED #40, YELLOW #5 (TARTRAZINE), YELLOW #6, RED #3, BLUE #1. 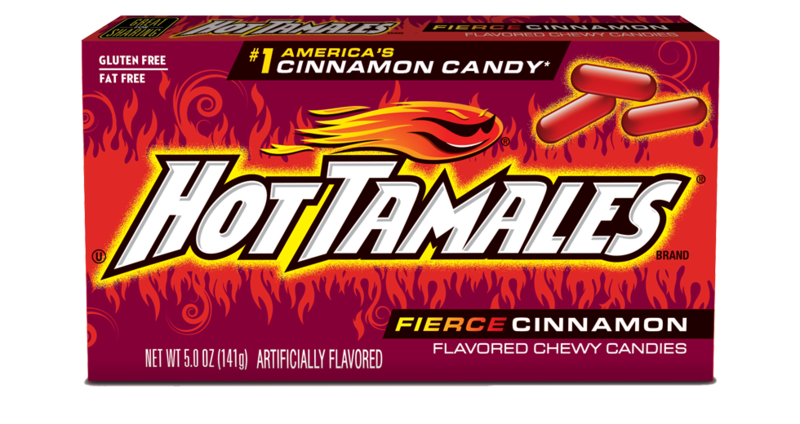 Fire up your taste buds with these one-of-a-kind, chewy, cinnamon flavored candies. 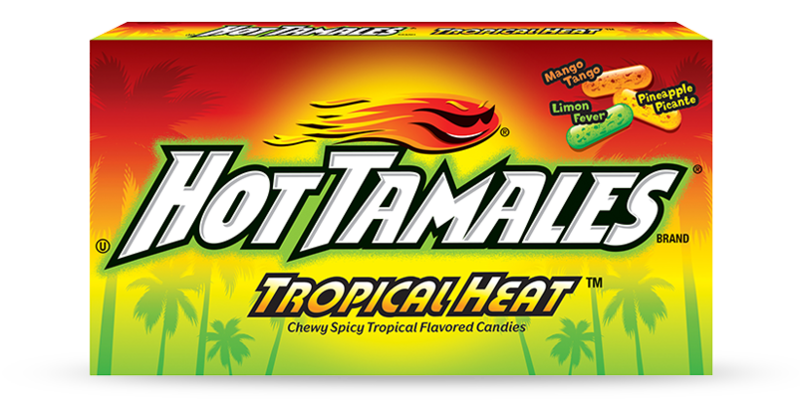 The original variety of HOT TAMALES® Brand candies delivers an intense burst of heat with every bite. So what are you waiting for? Grab a handful, and feel the burn! 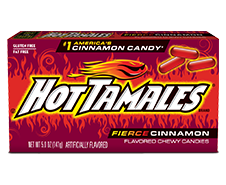 SUGAR, CORN SYRUP, MODIFIED FOOD STARCH, CONTAINS LESS THAN 0.5% OF THE FOLLOWING: ARTIFICIAL FLAVORS, DEXTRIN, CONFECTIONERS GLAZE, ARTIFICIAL COLOR, MEDIUM CHAIN TRIGLYCERIDES, CARNAUBA WAX, SODIUM CITRATE, PECTIN, CITRIC ACID, MALIC ACID, FUMARIC ACID, RED #40, YELLOW #5 (TARTRAZINE), YELLOW #6, RED #3, BLUE #1. 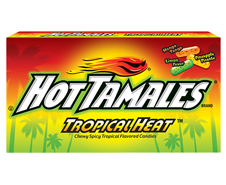 SUGAR, CORN SYRUP, MODIFIED FOOD STARCH, CONTAINS LESS THAN 0.5% OF THE FOLLOWING INGREDIENTS: FUMARIC ACID, NATURAL AND ARTIFICIAL FLAVORS, SODIUM CITRATE, DEXTRIN, CITRIC ACID, MALIC ACID, ARTIFICIAL COLOR, CONFECTIONERS GLAZE, RED #40, CARNAUBA WAX, MEDIUM CHAIN TRIGLYCERIDES, YELLOW #5 (TARTRAZINE), YELLOW #6, BLUE #1. 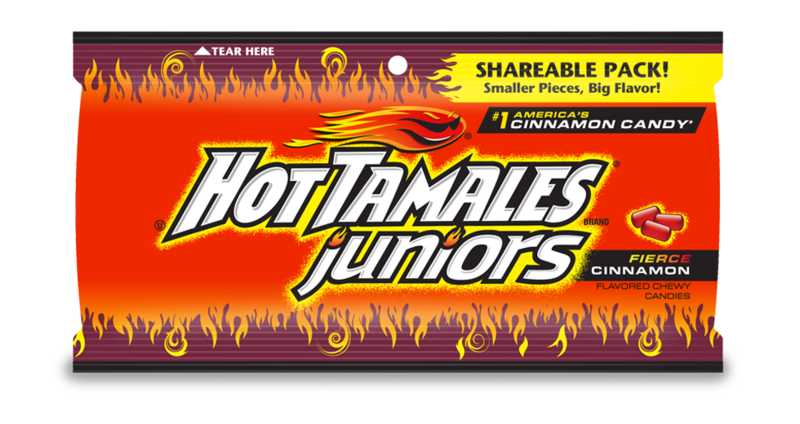 Tear and share a pack of our HOT TAMALES® Fierce Cinnamon Juniors, featuring smaller pieces with the same fiery flavor that HOT TAMALES® fans crave. 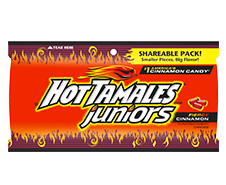 Also try MIKE AND IKE®Juniors! 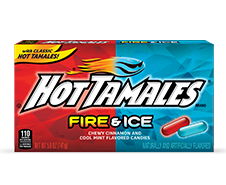 SUGAR, CORN SYRUP, MODIFIED FOOD STARCH, CONTAINS LESS THAN 0.5% OF THE FOLLOWING: ARTIFICIAL FLAVOR, DEXTRIN, CONFECTIONERS GLAZE, MEDIUM CHAIN TRIGLYCERIDES, RED #40, ARTIFICIAL COLOR, CARNAUBA WAX.